The East Green Lake Playfield, shown in part here, was the largest addition of park land made from fill piled on top of the old lakebed. The view looks north along the curving western border of that fill. [What follows first appeared in Pacifric Northwest Mag. 8/28/05.] 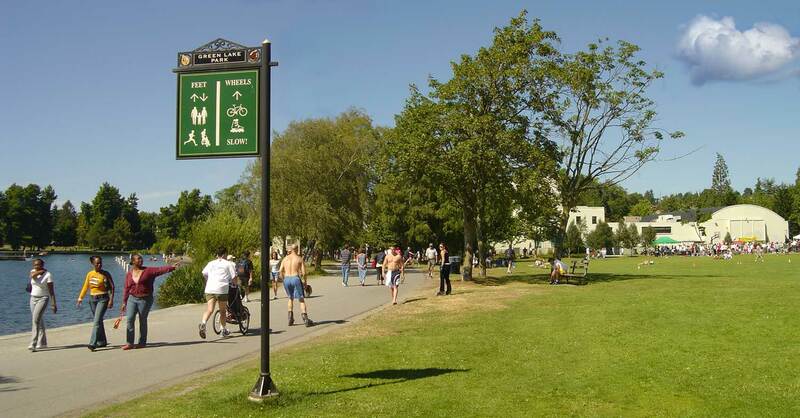 Thanks to Paul G. Pearson who sent along this week’s revelation of how a new shoreline was constructed for Green Lake, and with it the gift of a new city park. 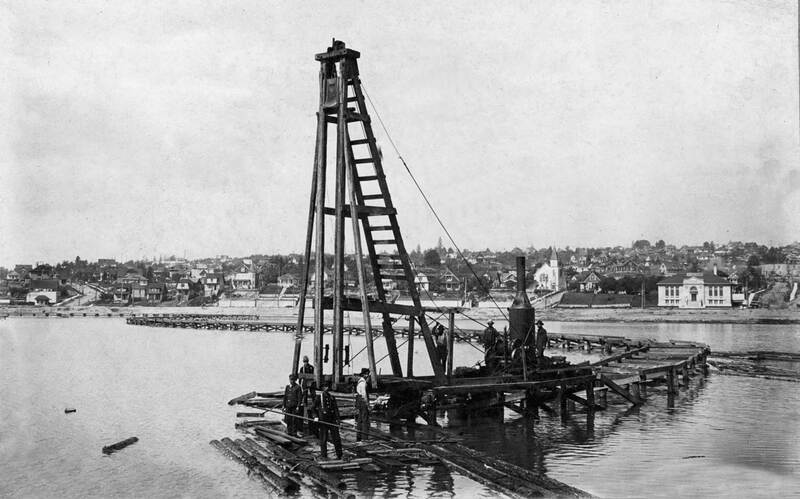 This view of a pile driver constructing its own throughway across the East Green Lake Bay was photographed in 1912. One year earlier the lake was lowered seven feet with mixed results. It robbed the lake of its natural circulation by drying up the stream that ran between the Lake and Union Bay on Lake Washington. (Decades of “Green Lake Itch” would follow.) But it also exposed a shoreline that was the first ground for the new park that was extended with fill. In all about two miles of trestle was built off shore from which more than 250,000 cubic yards of earth was dumped to form the dike. After another 900,000-plus cubic yards of lake bottom was dredged and distributed between the dike and the shoreline it was discovered that when dry the dredgings were too “fluffy” to support the park’s new landscape. More substantial fill from the usual sources – like street regarding, construction sites and garbage then still rich with coal ashes, AKA “clinkers”– was added. The historical photograph was recorded by the Maple Leaf Studio whose offices were one block from the new Green Lake Library seen here on the far right of their photograph. The exposed shoreline is also revealed there. Next week we will take a close-up look at this same section of E. Green Lake Way North in 1910 when the library was new and Green Lake seven feet higher.